Sling TV subscription service streams to smartphones, tablets and more | What Hi-Fi? We're well used to streaming our music- or video-on-demand without the need for a wired connection nowadays - yet it seems as though live TV broadcasting is resisting the trend... until now perhaps? A new subscription service costing $20-per-month has gone live in the US and it could well change how we watch TV – by streaming live content to a range of internet-connected devices. Sling TV is the name of the service and it offers a core programming package of both live and on-demand content – including sport, movies, drama, and more. There are also two optional add-on packs to select from. 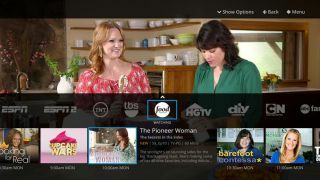 It's an over-the-top service (delivering TV over the internet) requiring no contract or hardware installation, and it is expected Sling TV will be supported by the likes of Amazon Fire TV, LG and Samsung smart TVs, and Roku products. Xbox One consoles, iOS and Android smartphones and tablets, and Macs/PCs are also compatible with Sling TV, with more streaming devices and smart TVs expected to be added in the future. The service is delivered via an IP-based content delivery system using adaptive bitrate technology. It includes a three-day replay feature that allows you catch up with content you've missed. "Sling TV provides a viable alternative for live television to the millennial audience," said Joseph P Clayton, president and CEO of DISH (the parent company of Sling TV). "[People] can now watch their favourite shows on their favourite devices that they already use to watch video. Live TV, including ESPN, for $20-per-month with no commitment or contract, is a game changer." At the moment, there doesn't appear to be any plans to bring the service to the UK, but if it proves a success with US households, we can surely expect this to change.